Create picture cards and communication boards! Perfect for Individuals with autism and augmentative communication needs! NO program installation is required for use of the CD. This software has been upgraded to include over 10,000 digital color photographs in 65 different categories. You can show or print 1, 2, 4, 6, or 8 pictures at one time with or without a printed word. Dozens of pictures of common verbs are included. Pictures look great when printed out in color or black and white. The program runs directly from the CD and does not require installation. Requires a CD-ROM drive and Windows 95 or higher. Black line illustrations that can be used as picture symbols for thousands of words! This book has printable pages with black line illustrations of picture symbols in a variety of categories- THOUSANDS of symbols are included that can be used to teach vocabulary and MORE. Save $49.00 on the book and 19 dollars on the software as part of this special combo offer. This book and software pack will help you to create communication boards and learning activities. 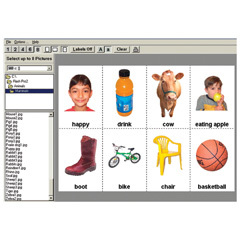 We offer a variety of augmentative communication resources. 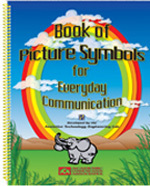 View the Picture Symbol Book Special (3 books).